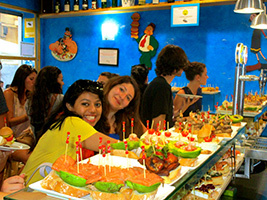 Combine Catalan gastronomy and Barcelona’s vibe in an evening walking tour throughout Barcelona. Get an overview of Las Ramblas, the most famous street of the city, and visit the renowned market La Boqueria, just before discovering fascinating cafes and restaurants in town. Later enjoy an engaging walking tour throughout the surprising Raval neighborhood and the lively Poble Sec area to become a part of the city’s cheerful atmosphere. 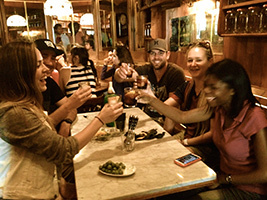 Mix with the crowds that go out for tapas after their working day, awakening the night life. You will want to stay in Barcelona and enjoy its rhythm forever. 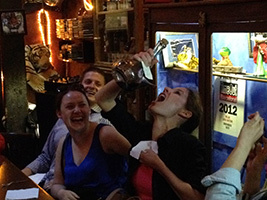 Uncover the secrets of the famous tapas (also for vegetarians) in an informal dinner. A variety of flavors that will shape a delicious meal as well as a mouth-watering experience in unique, trendy, old and new tapas bars. Thanks to the proper explanations and suggestions from your friendly gourmet guide , the meaning of buñuelos, sangria, pincho, montadito, tortilla and pa amb tomàquet will be very clear after the tour. 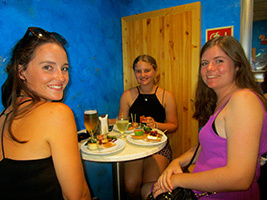 When you are back home, you’ll be able to invite your family and friends while recalling your adventure in Barcelona. End point: Poble Sec Neighbourhood, near Paral·lel Metro station. Por favor, dirígete a la siguiente dirección:Plaça Catalunya, delante del Hard Rock Cafe Duración del tour: 3 horas Idiomas del guía: español o inglés Hora de inicio: A las 17:00 horas. Asegúrate de llegar al punto de encuentro con al menos 15 minutos de antelación. Hora de regreso: A las 20:00 horas aproximadamente. Punto de finalización: Poble Sec Neighbourhood, cerca de la estación de metro Paral·lel Teléfono de emergencia: +34 690 69 80 13 Recuerda llevar el bono y un documento de identidad con fotografía válido.